Spaying/neutering is quick, easy and safe. The Humane Society of Charlotte has been providing spay/neuter services in Charlotte since 1982. Spaying is the removal of the reproductive organs of female dogs and cats. Neutering is the removal of the testicles of male dogs and cats. The HSC Spay/Neuter Clinic was the first low-cost clinic in the Southeast offering high quality, affordable surgeries. 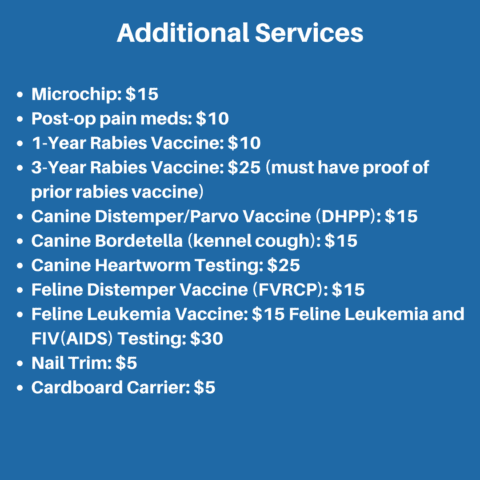 Spaying or neutering your pet and ensuring their vaccinations are up to date is not only good for your pets and your family but also creates a healthier community for everyone here in Charlotte, whether they have two legs or four. *Please note, our pricing has changed. For dogs, 51 – 75 lbs, an additional $15 will be charged. For dogs, +75 lbs, an additional $30 will be charged. Please contact us with any questions you have about HSC’s Spay/Neuter Clinic services. When you’re ready, simply contact our clinic to schedule an appointment. *Do you have community cats and would like to take part in our Trap-Neuter-Return program? Click here for Community Cat-specific information. 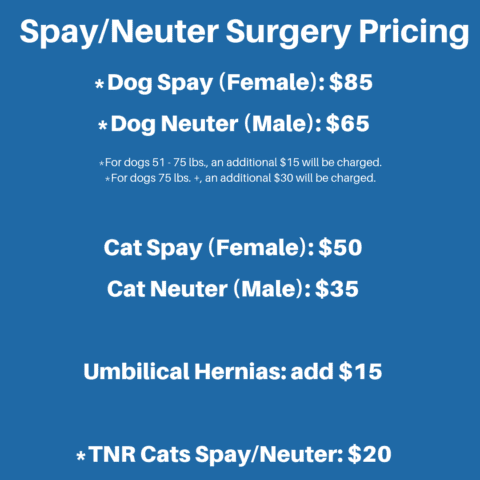 Spay/Neuter surgery pricing includes 3 days of take-home pain medication for dogs. Cats will receive an injection of a sustained-release pain medication that will last up to 72 hours. Pets 7 years of age and older require additional bloodwork at a rate of $55 to ensure the safety and health of your pet during surgery. Financial assistance may be available. Please book your appointment by phone if assistance is needed. Humane Society of Charlotte offers 10% discounts on all adoptions and services to seniors age 65 and older and to all military. Must show identification.